TEDxIIMRaipur is proud to present the first ever TEDx event in Chhattisgarh. The event with the theme ‘Thoughts, Actions and Beyond’ will be hosted at Hotel GT Star on 10th August from 11 am to 5 pm. It aims to highlight the ideas that have been acted upon, pursued relentlessly and yielded miraculous results. The event will witness six speakers who will share their thoughts and the subsequent journey undertaken. Akash Gautam, a renowned motivational speaker, enter-trainer and vocabulary enthusiast will share with the audience about his initiative ‘Akash ka Vocab Dhaba’. Neha Juneja, CEO of Greenway Grameen will educate the audience about her venture which aims to create environmental friendly ‘Bottom of the Pyramid’ products for rural consumers at low costs. Usman Shekhani, a grassroot level innovator from Kanker, Chhattisgarh will share about his innovation of a specialised device to make incense sticks and toothpicks. Yet another inspiration will be Vishnu Tadimeti, a 17 year old student known for his academic website portal. Pankaj Johar, a chartered accountant by profession but presently directs documentaries, will motivate the audience with his endeavours. Vijay Barse, founder of the organization Slum Soccer will impart knowledge about how his organization reaches out to the Indian homeless using football as a tool for social improvement and empowerment. The event also includes a special performance by two ‘ Hand Shadowgraphers’ Amar Sen & Sabyasachi Sen. They are the sole performers of this art in Pan-Asia. 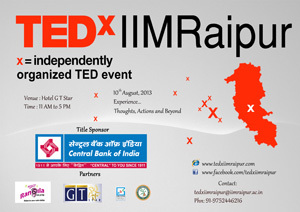 For more details regarding the entire event please visit http://www.tedxiimraipur.com.